(Bloomberg) -- China may be poised to take more stimulus steps to drive an expansion showing renewed signs of health. Officials are drafting measures to bolster sales of cars and electronics, according to people familiar with the matter, who asked not to be named because they aren’t authorized to discuss the plan. That news coincided with data showing a 6.4 percent year-on-year expansion in the first quarter -- beating economists’ estimates. Speculation over the stimulus swirled in the markets Wednesday, pushing up shares of domestic carmakers such as BYD Co. and automakers in Europe and the U.S. The Stoxx Europe 600 Automobiles & Parts Index rose as much as 2.1 percent, led by Volkswagen AG, Daimler AG and Faurecia SA. General Motors Co.. Apple Inc. climbed in the U.S., while Swedish home-appliance maker Electrolux AB also rose. China’s latest tactic indicates its leaders are stepping up attempts to support consumption and mitigate threats posed by trade tensions with the U.S. An ambitious tax reduction program is seeing some early signs of bearing fruit: retail sales expanded 8.7 percent in March to beat expectations, and first-quarter gross domestic product expanded more than economists estimated. The proposals include subsidies for new-energy vehicles, smartphones and home appliances, and are at a consultation stage with other government branches, with no guarantee that they’ll be approved, the people said. The National Development and Reform Commission, which is said to have drafted the plan, didn’t immediately respond to a fax seeking comment. 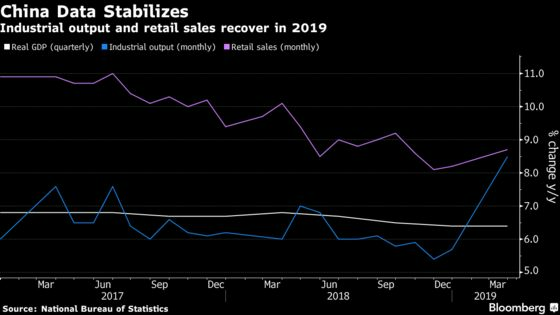 For a slowing global economy -- on display Wednesday with Germany’s government cutting its 2019 growth estimate -- China’s stabilization and the prospect of stimulus is a relief. 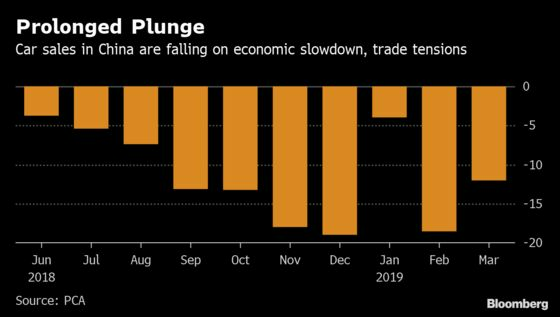 It’s also a sharp reversal from as recently as January when key readings were pointing to a pronounced downturn, a factor U.S. officials have touted as leverage in their push for a trade agreement. It’s notoriously difficult to own a car in major Chinese cities because of quotas to tackle traffic congestion and air pollution. In Beijing, the annual new vehicle quota dropped to 100,000 in 2018, and each licensed gasoline-fueled car has to be idle one day a week. “Any relaxation of the restriction would be medium-term supportive but also a reflection of how weak the current environment remains," Arndt Ellinghorst, a London-based analyst at Evercore ISI, said in a report. "If all the cities were to relax the curbs by 15 percent to 20 percent, then we could see a one-time boost of around 1 percent in Chinese auto demand." The case for stimulus was bolstered by less rosy data that accompanied news of the growth rebound: The surveyed jobless rate remained over 5 percent for a third month and the nominal growth rate, which is un-adjusted for price trends, decelerated. Trading in old phones for new ones also would be subsidized under the plan, according to the people. That could help the smartphone industry rebound after shipments declined 9.7 percent in the fourth quarter to 103 million units, according to International Data Corp. The leading domestic brands include Huawei, Oppo, Vivo and Xiaomi, with Apple being the only overseas maker ranked in the top five in sales. China’s latest proposal doesn’t cover luxury goods such as fashion and cosmetics, an industry that is in its third year of rapid growth and is also highly reliant on the local economy. Consumers there continue to seek out purchases from LVMH Moet Hennessy Louis Vuitton, Gucci owner Kering and Hermes International. L’Oreal SA said Tuesday that it took in more revenue from Asia than its home market of Western Europe for the first time last quarter.